BDBL Career Opportunity 2016. 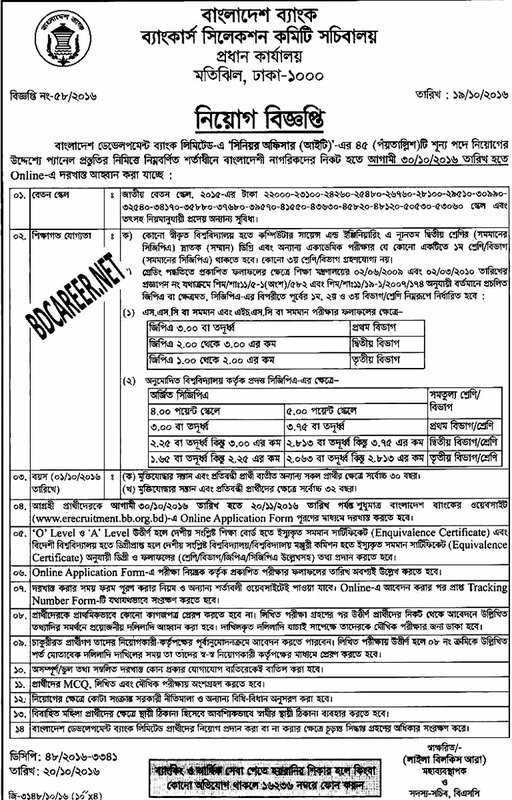 Bangladesh Development Bank (BDBL) will recruit 82 vacancies for the post of Senior Officer and 45 vacancies for the post of Senior Officer IT for the year 2016. BDBL New Job circular 2016 for the post of Senior Officer and Senior Officer IT published on 19 October 2016. Interested and suitable Bangladeshi Citizenship applicants are requested to apply online for the empty posts. In this regard, interested and eligible candidates are taken part in the MCQ, Written Test, and Viva voice exam. Interest and eligible candidates are requested to apply online through only Bangladesh Bank Website i.e. www.erecruitment.bb.org.bd. Candidates need scanned passport size photograph and signature for online application.